Janet Adams is an Administrative Support Specialist in the Hayes School of Music. She works with student records, schedules auditions, and assists the Associate Dean. She has worked in the music office since 2005. Janet is a violist and Cannon Music Camp alumnus. 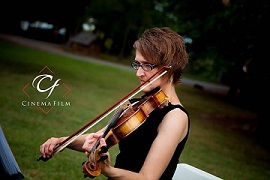 She has played in local string quartets for weddings and other events, as well as holiday performances for area churches. She lives in West Jefferson with her daughter, Hannah, and two cats, Mocha and Cleo.